Planning a magical day with your little ones? A romantic evening with your special someone? A fun-filled work Christmas party? Something for everyone at Winter Wonderland. From 23rd November 2018 until 6th January 2019 we will be open every day from 10am – 10pm, except Christmas Day. It’s not just Santa that needs a rest on Christmas Day! 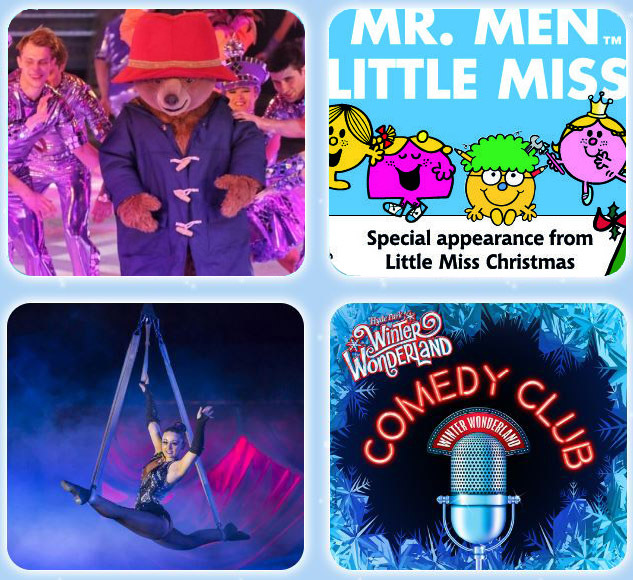 Lots of new attractions including Peter Pan on Ice, Teletubbies Christmas Show, Ice Sculpting Workshops, and our very own Comedy Club but let’s not forget our returning favourites, including an even bigger ice rink, jaw dropping acts in the Circus MegaDome and so much more. Explore the land of Santa, brand new and exclusively designed this year. See his workshop, meet the elves or ride on the Santa Express. An enchanting experience with children’s rides, games, eateries and all the magic of Christmas!